SCVHistory.com LW2835 | Lebec | Lebec Hotel Coffee Shop with Santa Fe Trailways Buses, 1940s. Santa Fe Trailways buses stop off at the Lebec Hotel's coffee shop, color postcard, 1940s. 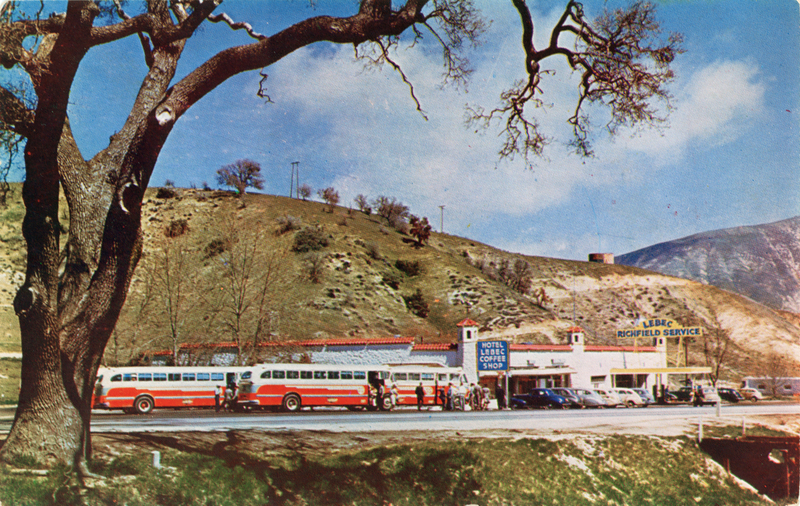 Back of postcard reads: C1059 — Lebec, California — Santa Fe busses [sic] crossing the mountains between Bakersfield and Los Angeles on U.S. Highway 99, make a rest stop for passengers at this attractive point — Lebec. About the Santa Fe Trailways: The Southern Pacific Railroad had a lock on the coastal route from Los Angeles to San Francisco; the Atcheson, Topkeka and Santa Fe was stuck with a route that took passengers through Mojave and Barstow. So in the 1930s, as the modern Highway 99 was replacing the nerve-rattling Ridge Route, the ATSF saw an opportunity. Over the SP's protests, it convinced the California Railroad Commission to let it run a hybrid rail-and-bus line beginning July 1, 1939. San Francisco-bound passegers boarded a bus — Santa Fe Trailways — in Los Angeles and rode to Bakersfield, with stops in Hollywood, North Hollywood, Castaic and Lebec. At Bakersfield they boarded ATSF's fancy new diesel trains, called the Golden Gates. They rode the rails to Oakland (with stops in Shafter, Wasco, Corcoran, Hanford, Fresno, Merced, Stockton, Richmond and Berkeley). At Oakland they switched back to a bus and rode across the new Bay Bridge (opened 1936) to San Francisco. Santa Fe's chief competitor for bus service was a Southern Pacific affiliate at the time — Greyhound. About the postcard publisher: Photographer Mike Roberts opened his studio in 1939 and was the first printer of photochrome postcards using the new Kodachrome color film. He became a partner in the firm that issued them, Color Card. Mike Roberts Color Products Inc. produced cards until the mid-1990s; in 1996 he moved his business to San Diego under the name Scenic Art Inc.
LW2835: 9600 dpi jpeg from original printed postcard purchased 2016 by Leon Worden.